Mona Mahall & Asli Serbest. Photo by Patricia Parinejad. The OfficeUS Website is based on open source technologies and existing platforms to provide social, technological and spatial spaces of convergence and disruption that allow users and visitors to move through time (1914-2014) and space (Venice-Worldwide) with access to historical material and real time production and discussion. OfficeUS Webiste has been designed by M-A-U-S-E-R, OfficeUS Partner and Directors of the Department of META. Based in Stuttgart and Istanbul, Mona Mahall and Asli Serbest, M-A-U-S-E-R, represent the practice and research of the Micro Architecture Unit Star Energy Ray. 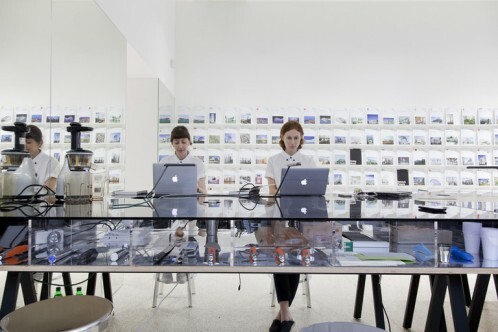 As an undisciplined, collaborative studio they reflect and produce architecture in and through different media. Their only, quasi-universal, principle is that ideas – although being shaped by certain linguistic, social, political, technological, and interpretative conditions – dominate their strategies, procedures, and objects. Therefore, M-A-U-S-E-R’s work can come as building, installation, video, graphic, sound, text, etc. – depending on the idea behind. It can use existing forms or develop anti-forms. It is shown in their self-published magazine Junk Jet, in their texts for e-flux journal, Perspecta, etc., and in their exhibitions at Künst–lerhaus Stuttgart, General Public, Berlin, Storefront for Art and Architecture, New York, etc. Mona and Asli each completed a PhD on a critical reflection of modern speculative architecture. Currently, M-A-U-S-E-R holds the chair of fundamentals of design at the Stuttgart State Academy of Art. As Partners of OfficeUS, Mona and Asli integrate what is usually separate. Depending on the moment, they become webmasters, existentialist philosophers, Palm Jockeys, members of the cabin crew, or architects that from a long way off look like flies.